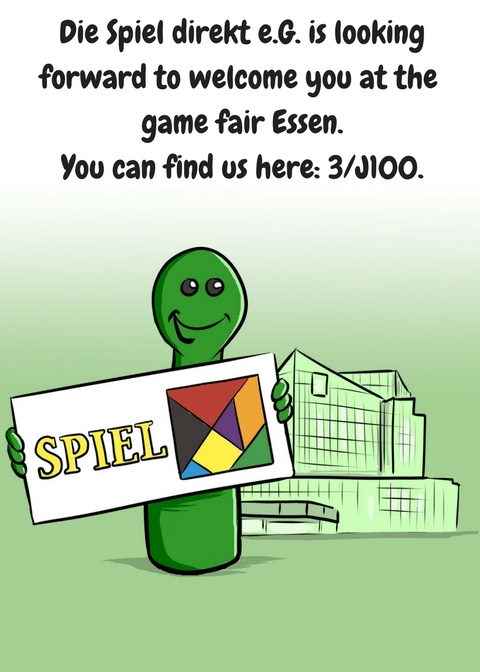 game fair Essen is straight ahead. We are looking forward to welcome you at Spiel direkt eG common stand. Furthermore you get an overview of our publishers and games, which are represented at our Spiel direkt eG common stand. Fobs Games with Tiefe Taschen. Haas Games with Genies and Food Facts. Sphinx with Klick! Klick! Bäng!, Alltagswahn Autobahn and the Comic Echo des Wahnsinns. That's Me with the same titled game That's Me. Fantasmagoria with Battalia Die Schöpfung. franjos Spieleverlag with Mahé und Can't stop. Müller Mätzig Spiele with Da Yunhe. Stand: 3/J100 - We are looking forward to see you!